Postulate: The greatest differentiator for iOS is the quality of its apps. If total Android engagement moves decisively above iOS, the fact that iOS will remain big will be beside the point – it will move from first to first-equal and then perhaps second place on the roadmap. And given the sales trajectories, that could start to happen in 2014. If you have 5-6x the users and a quarter of the engagement, you’re still a more attractive market. This is a major strategic threat for Apple. A key selling point for the iPhone (though not the only one) is that the best apps are on iPhone and are on iPhone first. If that does change then the virtuous circle of ‘best apps therefore best users therefore best apps’ will start to unwind and the wide array of Android devices at every price point will be much more likely to erode the iPhone base. Part of the reason for spending $600 on an iPhone instead of $300 on an Android is the apps – that cannot be allowed to change. Still, Evans is careful to note that apps are “not the only [selling point]” for the iPhone. 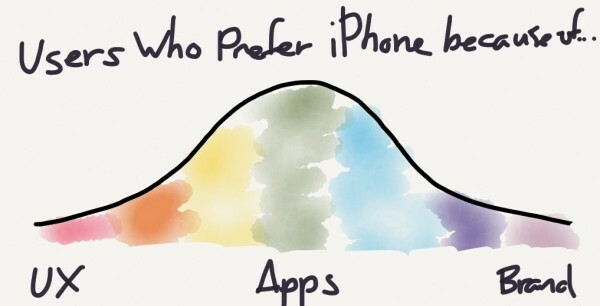 As well he should: there remains an elegance and refinement to iOS relative to the competition that a certain breed of user will simply not give up, even if Android had unique apps. To the left are the folks I just referenced, who care above all else about the user experience. They would buy an iPhone even if Android had an app they desired. In the middle are people who buy an iPhone for the apps, and on the right, for branding. Again, this is just the top-level preference; a user may prefer the iPhone’s UX, app selection, and branding, but by definition something is the most important. People – developers – aren’t just numbers. They have tastes. They have biases. If they didn’t, then all the great iPhone apps of 2008 would have already been written for Symbian, PalmOS, BlackBerry (J2ME), and Windows Mobile years earlier. If they didn’t, then all the great Mac apps would have been migrated to Windows a decade ago. Productivity apps are the most attuned to the underlying platform, particularly from a UI perspective, and thus have the highest incremental cost to supporting multiple platforms. In fact, and this is the crucial point, I could have consolidated all of the bell curves, because I believe they are highly correlative. Ultimately, though, neither tail is particularly interesting; it’s the massive middle that moves markets. While I had similar thoughts to Ritchie about the relative quality and associated motivation of a certain breed of iOS developers, most people aren’t buying iOS devices because of OmniFocus. Rather, it’s apps like SuperCell’s Clash of Clans, the third-most grossing app in the App Store, or Instagram in the months before the Android version launched, that differentiate the iPhone. 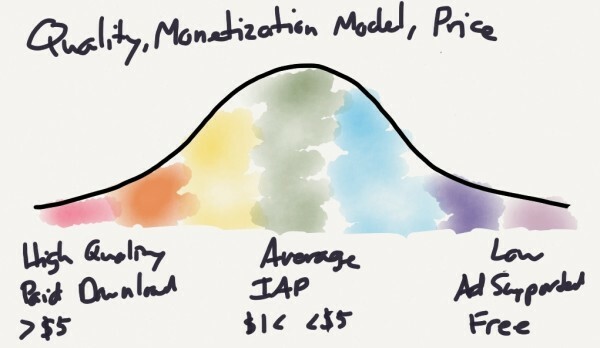 Apps like that fall solidly on the middle-to-right side of these bell curves: their developers are much more concerned with making money or maximizing their back-end investment than they are in scratching their own itch, and they will do the exact calculations Evans has suggested. The average Android smartphone user is worth much less than the average iPhone user, but there are lots more of them. Let’s be super clear: both Evans and myself are quite dismissive of the idea that iOS:Android::Mac:Windows. But one lesson that can be drawn is that for many developers, money is motivation enough, and for just as many users, app availability – especially games – trumps the user experience. Evans is right: the lower-cost iPhone can’t arrive soon enough. One final thing worth noting is geography. In the Valley, the iPhone reigns supreme. It’s genuinely surprising when folks don’t have an iPhone (although not as surprising as when they don’t have a Mac). In Asia, though, Android is far more popular, and it’s Asia where there is, by far, the most growth to be had for smartphone manufacturers. If Android-first development becomes a reality, it will happen here first.